Discover your perfect stretch mark minimising routine. 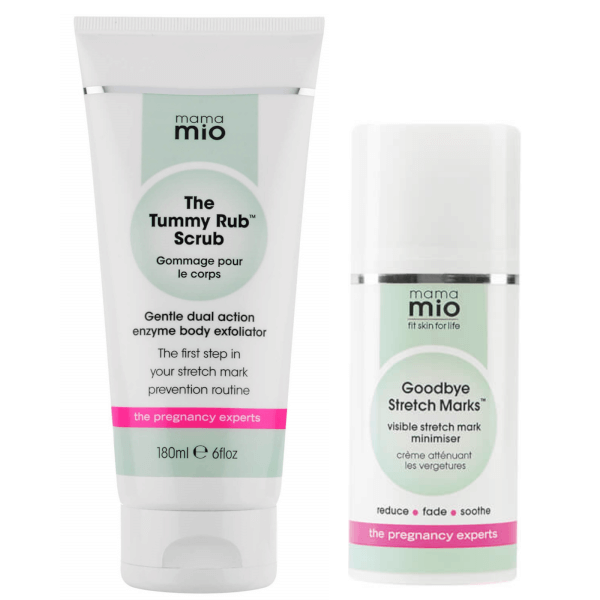 Containing a full-sized Tummy Rub Scrub and full-sized Goodbye Stretch Marks, use this duo together to get the best results from your stretch mark routine. Reduce the appearance, colour and texture of existing stretch marks with the powerful minimising cream, Goodbye Stretch Marks. Uniquely formulated with highly effective peptides, fruit enzymes and nourishing oils it’s been clinically proven to help minimise the appearance of stretch marks. Minimising Cream: Apply a thin layer over each stretch mark (like finger painting). Apply three times a day for 12 weeks for maximum benefits. We suggest you take a 'before' and 'after' picture so that you can really appreciate the change. Minimising Cream: Aloe Barbadensis Leaf Juice, Glycerin, Cyclopentasiloxane, Methyl Glucose Sesquistearate, Aqua (Water), Methylsilanol Mannuronate, Persea Gratissima Oil, Cetearyl Alcohol, Cetyl Alcohol, Sodium Stearoyl Glutamate, Squalane, Butylene Glycol, Prunus Amygdalus Dulcis Oil, Caprylhydroxamic Acid, Lactic Acid, Sodium Lactate, Sodium Palmitoyl Proline, Tocopheryl Acetate, Parfum, Limonene, Hydroxyethyl Acrylate/Sodium Acryloyldimethyl Taurate Copolymer, Nymphaea Alba (Water Lily) Flower Extract, Glyceryl Caprylate, Ascorbyl Palmitate, Phyllanthus Emblica Fruit Extract, Carbomer, Linalool, Palmitoyl Tetrapeptide- 7, Palmitoyl Oligopeptide, Ascorbic Acid, Cetyl Hydroxyethylcellulose, Citral, Citronellol, Evernia Furfuracea Extract, Palmitoyl Oligopeptide, Rutin, Phaseolus Lunatus Seed Extract, Polysorbate 20.